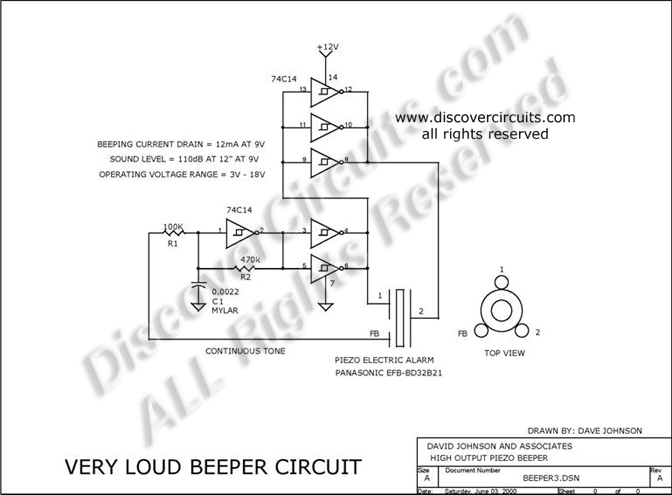 Circuit: VERY LOUD BEEPER CIRCUIT__ Circuit designed by David A. Johnson, P.E. This circuit generates a continuous tone instead of a pulsing one. The circuit delivers about 110db (12 inches away) from a 9v battery using a single inexpensive C-MOS IC. An off-the-shelf piezoelectric beeping device is driven at resonance to insure maximum efficiency.